in 1 block = 4" x 4"
This design is good for a boy or a girl depending on what solid color you use to make it. The floral block pattern is easy to crochet in sc, dc, and ch. 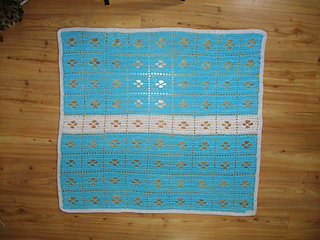 A easy border in a contrast color is added after finishing the blanket. Use 1100 yards of DK/sport weight with a size H crochet hook for a 37.5” x 37.5” (9x9) blanket. Use 950 yards of worsted weight with a size I crochet hook for a 40” x 40” (8x8) blanket. The 5 page pattern has written and charted instructions for two sizes in both weights of yarn.